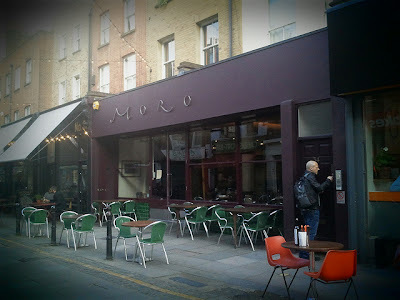 A good friend of the sort that knows about restaurants took your author to Moro on Exmouth Market last week, and the experience was thoroughly enjoyable. Established in 1997 by Samuel Clark and Samantha Clark, Moro was - we are told - the result of time wandering in Spain, Morocco and the Sahara, and remain popular today. As a result of their journeys, the restaurant has tended to focus on Spain and the Muslim Mediterranean but there really is something for everyone who likes good food and wine, and certainly something for those who enjoy North African cuisine.